Why is the Renaissance important? There are many highly interesting periods of history to learn about, but one of the most fascinating is that which covers the fifteenth and sixteenth centuries in Italy. The level of artistic and architectural production during this time is astounding, so much so that centuries later works produced during the Renaissance continue to capture the public’s imagination. Generally speaking, there are many reasons why the Renaissance is an important area of study. Not only is the period highly engaging, but it also offers us several lessons by which we can approach the world today. Here are a few reasons why the Renaissance is worth studying. Have you ever looked back to history with admiration, excitement, or nostalgia? Many people do, which is probably why history-themed TV shows and books continue to attract people’s attention in the world today. We might think that those who came before us lived in more interesting times, or maybe that they lived in cultures which were superior to our modern culture. During the Renaissance, people also looked to their past with a sense of admiration and in search of guidance. They did not look to the previous century, but instead to the ancient Greeks and Romans, whose civilizations existed more than a thousand years earlier. Patrons, scholars, artists, and engineers of the Renaissance looked back to their ancient ancestors in order to help them craft their world in the fifteenth and sixteenth centuries. It is really not surprising that this started in Italy, since many of the old ruins still standing in the Renaissance period would still have been considered engineering marvels – the products of some advanced people who once occupied the land. While the challenges that each generation faces differ from those faced by previous generations, many of the same basic issues persist. How do we approach issues that we face today, whether they be political, economic, or social? Do we think that coming up with some new and “enlightened” solution to problems is always the best, or do we stop and consider how similar problems were addressed at different times in history? The Renaissance teaches us the power of looking to the past for insights and inspiration in dealing with today’s issues. By looking to the past for guidance today, not only can we find potential sources of answers, but also ways to address current challenges that previous societies have faced. While the Renaissance is mostly considered in light of the historical thinking that went on in the fifteenth and sixteenth centuries, leaders of that time could be very forward-thinking in their approaches. The Scientific Revolution was still centuries away, but we can still find in the Renaissance a push towards using new means to address problems. In the world of art, principles of perspective were explored which allowed for the creation of more and more realistic illusions in painted and sculpted images. 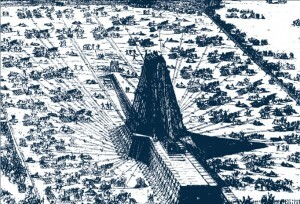 Engraving showing workers transporting an obelisk near St. Peter’s Basilica in 1586. In the world of engineering, we find challenges being overcome through the use of forward-looking innovation. One of the most famous examples of this is when Filippo Brunelleschi designed and executed the dome which covered the transept of the Florence cathedral. When the church was built in the fourteenth century, a large hole was left in the ceiling because no one knew how to cover it with a dome. It was not until Brunelleschi used an original approach in the early 1400s that the problem was solved. In the late sixteenth century, we find another remarkable example of engineering innovation in Domenico Fontana’s transport and installation of a large obelisk in front of St. Peter’s Basilica. In painting, we see a tremendous change in the realism of portrayed figures and spaces thanks to new developments in perspective and painterly technique. Innovation is something that we have a lot of today, but much of it rests on the shoulders of previous generations that engaged in much trial and error. We can better appreciate what we have today by recognizing the groundwork that was laid in the past. This holds true not only for the technology itself, but also for the willingness to try experimental means of overcoming challenges. In the Renaissance, there was a prevailing humanist belief in the ability of the human person to rise to challenges of the day, and this belief gives us a model for courage in doing what no one has done before. In historical retrospect, the Renaissance is arguably the best example of a civilization with its feet in worlds of the past and the future. While all ages are guided by visions of what came before and what lies ahead to a certain degree, the way that those living in the fifteenth and sixteenth centuries (particularly in Italy) straddled ancient and modern is particularly impressive. Historians today consider the period preceding the Renaissance to be the Middle Ages, which effectively began with the fall of Rome in the fifth century and lasted for some eight or nine centuries. Although the Middle Ages cannot be thought of as an entirely homogenous entity, we might say that the rate of change during that time was relatively less when compared to history during and after the Renaissance. Following the Renaissance, the world started changing in several significant ways. The Enlightenment, the Industrial Revolution, and the Scientific Revolution gradually developed on the heels of the thinking that had emerged in the decades and centuries before. The Renaissance was thus the “gateway” to the modern world. At least in some circles, it is called the “Early Modern” period – even if we might not ordinarily think of anything in the fifteenth century as being “modern” at all! After looking back through the history of Western Civilization, one can reasonably point to the Renaissance as the one period that best ties everything in its past with everything in its future. In Renaissance art and architecture, the results were amazing; people still flock from around the world to see the works of Renaissance masters, and these works continue to dominate our visual vocabulary. Today, we can learn a lesson or two from the Renaissance example. We need to look to our past and also to our future while we live in the present, and we should be more conscious of our place in history. It may be easy to forget the larger picture, but we could very well regret such blindness. This is a site for information and analysis of the world of the Italian Renaissance. Text is original to this site (ItalianRenaissance.org). ItalianRenaissance.org, "Why is the Renaissance important?," in ItalianRenaissance.org, June 29, 2012, http://www.italianrenaissance.org/why-is-the-renaissance-important/.